Marchers walk through campus during Take Back the Night 2018. In November, Education Secretary Betsy DeVos proposed major changes to Title IX guidance for universities that create a new set of rights for anyone accused of sexual misconduct, a move that will almost certainly affect how AU and other universities handle Title IX complaints. Some of these changes include a mandatory hearing for all complaints, an opportunity for questioning of the person who filed the complaint during the hearing and a new definition of sexual harassment. The University changed its Title IX model from a hearing model to an investigation model in the fall of 2017, meaning that when a complaint is filed, the Title IX office will review and investigate the case to determine if the accused individual is responsible. With the department’s proposed changes, colleges and universities would be required to hold a hearing with both parties involved to determine if the accused is responsible. “We believe the investigative model is more student-focused and allows students to better represent themselves,” Regina Curran, AU’s Title IX coordinator, told The Eagle in December. AU would likely adopt the definition of sexual harassment as the lowest standard, meaning if something more egregious occurred, the University can still consider it sexual harassment, Curran said. Students will likely see the changes in the Title IX process take effect in about six to 12 months, Curran added. 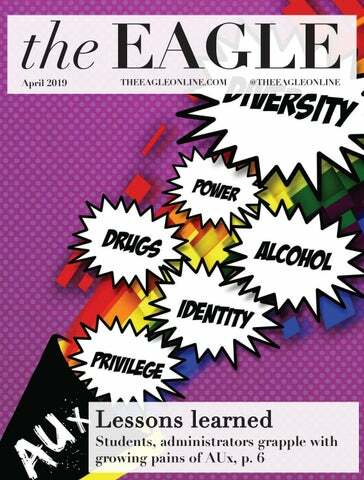 In November, Fanta Aw, the vice president of campus life and inclusive excellence, said in an email memo that the University will assess the new policies once they are officially in place. “We are following the process closely, and the implications of any revisions to federal guidelines will be reviewed and discussed thoroughly with our community before any required changes would be implemented at AU,” Aw wrote in the Nov. 26 email. The scope of Title IX is narrowed through what complaints can and can’t be filed under that umbrella. The new mandate would require that anything filed under Title IX occur at a school-sanctioned event rather than an off-campus event or social function. “With all new regulations, there’s the letter of what it says and then there’s the myriad of ways people interpret that,” Curran said. Clarification of the regulations will likely come as a result of the public comment period, in which interested parties can ask questions about the policies. The Department of Education is required to review and respond to public comments, which can be submitted until at least Jan. 28. Earlier this month, the department said it would extend the deadline until past Jan. 28 in order to ensure that the period will be 60 days but didn't specify an end date. The new revisions to Title IX would require an investigation stage, a hearing stage and written documents provided at both stages. It is during the hearing that questioning of both sides can take place. Additionally, the use of witnesses will greatly affect how these hearings are conducted. Curran explained that if a party or witness used in the investigation does not participate in the live hearing process, whatever evidence they presented must be thrown out. This can influence a student’s decision to conduct a Title IX investigation or to participate in the process, she said. There are a lot of unanswered questions about what type of adviser would need to be provided and how the University would go about doing so, she added. Curran encourages students to participate in the public comment period. This article has been updated to reflect that the public comment period has been extended to past Jan. 28.